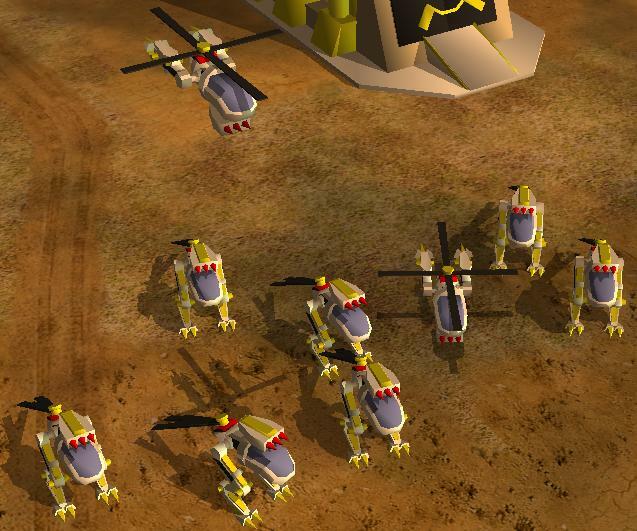 The Empire has created a multiroled unit that serves as both an anti-ground helicopter and an anti-air ground unit. 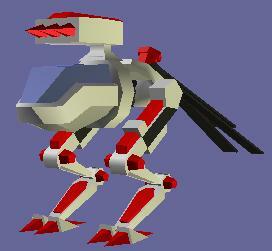 It walks on two feet, and can do a sumersault into the air and deploy into a helicopter. The uses of thes machine seem very vast, but rested assure, it has weak armor, is slow, and totally won't be spammable in Invasion Confirmed. I just got this one ingame. 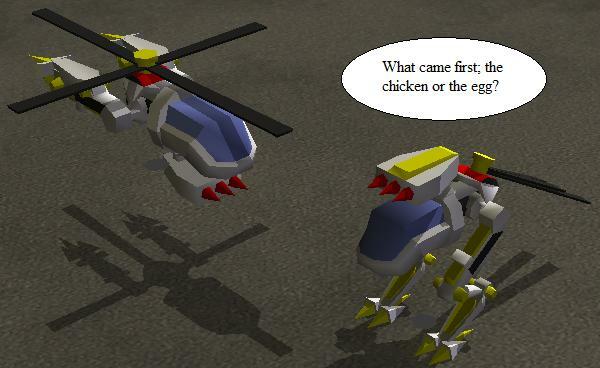 I haven't animated it yet, and I haven't done the helicopter version either. Reminds me of many Spore creations. But hey, the overall quality is pretty good. For something that looks really weird, it looks good. Shouldn't the rockets tilt upwards? I mean, it's an AA. Well, the who vehicle can pivot at the hips I guess, so adding multiple points on the vehicle where it can pivot might not be a good idea as many moving parts=many things that could go wrong. Anyways, I got the flying version of it and it works like a charm. 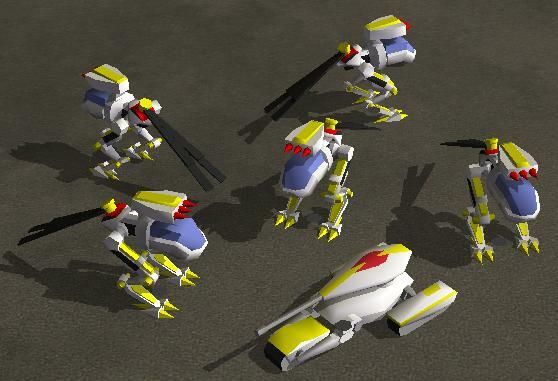 You build the walker, select it, and just like the nanocores and other transforming units, hit a button (the hotkey for which is 'd') and it will turn into the helicopter version and float up into the sky. You do the same thing for it to turn back into the ground state, only (and I find this funny) it will turn back into the ground state in the air, and then fall to the ground and land. It takes a little bit of damage, but I'll see what I can do about it. So.... When it deploys into a walker, it takes damage? Flying state looks good - nothing wrong with it. BTW, is it possible to have an animation between deploy and undeploy? I didn't make it that way, it's just that a thing that cannot fly is created far above the ground (aka the helicopter is replaced with the mech), so the only thing it can do is fall, which means it takes damage. 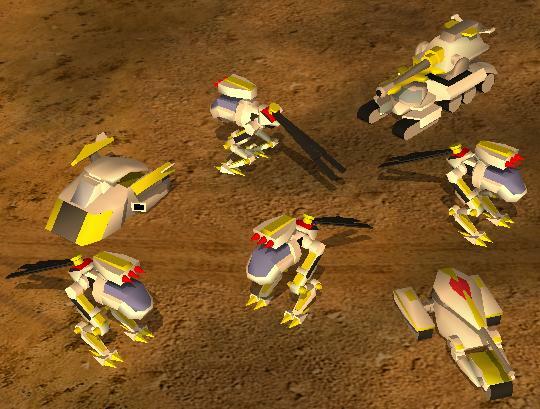 The only way I think I can make an animation would be if I made a third unit, an inbetween for the walker and the copter, and have that unit have a life span of whatever the animation length be, and upon completion it turns into the next unit. That might also be able to fix the damage taking part, but I guess I'll figure it out as I go along.